Make your morning something special with this oh-so-delicious Super Seedy Coconut Oil Granola. It is jam-packed full of nuts and seeds and is naturally sweetened with maple syrup and some coconut sugar. Store in an airtight container, or if you make too much (there is no such thing as too much granola) then store in the freezer and just pull it out when you need it. I just love making my own granola, and being in control of the ingredients going into my body first thing in the morning. The kiddos love helping as well, and it always makes for a fun (and sometimes messy) afternoon activity. Getting them involved ensures they will request little granola parfaits for breakfast the rest of the week, which in turn means no backing and forthing with questions about who wants what and who is going to eat what….if you have kids you know what I mean. Super Seedy Coconut Oil Granola is easy to put together, jam-packed with nuts and seeds and coconut oil and it is naturally sweetened to boot. It pairs beautifully with some whole milk (dairy or non dairy – you do you), with some yogurt in a parfait, or as a crumb topping on some baked or poached fruit. It also tastes delicious eaten in handfuls straight from the baking dish…. I love hearing from you, so if you try out my super seedy coconut oil granola then be sure to pop back and leave a comment to let me know what you think. Happy Eating. I love homemade granola. As you mentioned, it’s so good to know what’s going into it when you make it yourself. Plus, it’s so much more economical! I love that you’ve used coconut oil in it. 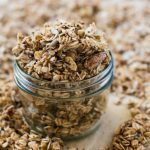 Will definitely give this a try when our granola supply runs out later this week…granola and yogurt is a go-to breakfast in our house! Thanks Amanda! My kids are the biggest granola fans, so its requested pretty much every second day – it is definitely our go to!! I’ve never made my own granola! (I have made muesli, does that count?) But I’m totally on your side, I’d much rather eat things that I’ve had total control over. This looks delicious! Yeah muesli counts 🙂 Thats a favorite around here for breakfast too! I love that you can get your kids to help you make your own… I had my niece help me one day last week… we ended up with coconut and chocolate only… she didn’t want anything else in it… I tried to explain to her that wasn’t really granola…. I need to try chia in our granola… I love it in my smoothies but have never put it in the granola… good idea! Haha yes my kids would totally choose only coconut and chocolate if given the chance. I put all the ingredients out so they know they have to use everything, although sneaking all the chocolate while cooking is inevitable for them, and they end up with none left for whatever we are making 🙂 I love the chia in granola as it gives an extra little crunch! I love homemade granola and being able to choose which ingredients to add. Personally, I skip the chia because of that weird glutinous mouth feel, (better in jam to me) but everything else sounds perfect. I’m into that french yogurt these days with a swirl of homemade jam… This granola would be the perfect topper!